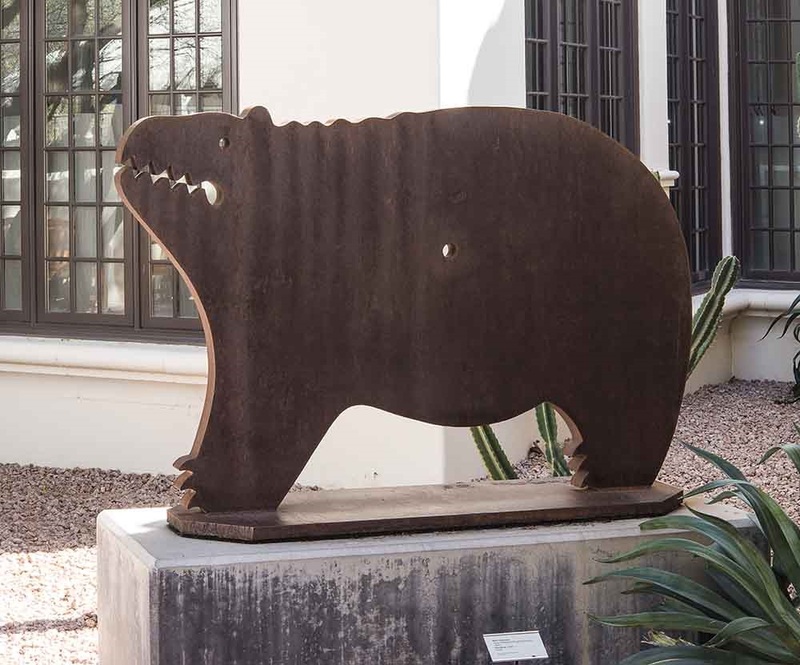 PHOENIX – Bank of America announced that it is awarding the Heard Museum funding to restore eight iconic sculptures by notable American Indian artists through the bank’s 2015 global Art Conservation Project. Since the program’s inception in 2010, Bank of America has provided grants to museums in 28 countries supporting 85 conservation projects. In each of the works being restored at the Heard Museum, the sculptor presents a contemporary vision of his ancestral culture, giving the viewer new perspectives on American art. The conservation, on view to the public as the process unfolds, will create new opportunities for the museum as well as an educational venue for members and visitors. Among the sculptures exhibited on the museum grounds to be restored are two by Chiricahua Apache artist Allan Houser (1914-1994), considered the patriarch of American Indian sculptors, Earthsong, composed of Alabama marble, and the bronze Seeking Harmony; three bronze pieces by Aleut artist John Hoover (1919-2011), Crane Woman, Heron and Turtle and Aleut Dance Staff; and two by Chiricahua Apache Bob Haozous (born 1943), Zen Bear, of oxidized steel, and White Steele out of carved marble. In addition, funding will restore the natural limestone patina to Navajo Water Girl, a donation of Doug Hyde (Nez Perce/Assiniboine/Chippewa, b. 1946) that has never been exhibited at the Heard because the original owner had the piece outdoors where city pollution resulted in grime and discoloration. Navajo Water Girl measures 66.5 inches x 24 inches by 27 inches. Hyde, who studied with Houser at his Santa Fe studio, is known for his monumental-sized sculptures which portray historical events. “Our Art Conservation Project is designed not only to conserve artworks and shine a light on the need for the preservation of artistic and historic treasures, but also to educate communities, and convey respect for the varied cultures and traditions throughout the world,” said Bank of America Arizona Market President Benito Almanza. The 2015 Art Conservation Project supports the restoration of a diverse range of works including the marble figure of the Buddha Amitābha at the British Museum in London; an oil on canvas, The Mellow Pad, by American artist Stuart Davis (1982-1964 at the Brooklyn Museum in New York; Édouard Manet’s Women in Evening Dress (Femme en robe de scarlet) at New York’s Guggenheim Museum; four paintings in original frames at the Harriet Beecher Stowe Center in Hartford, Conn., including two by Stowe; and Vincent van Gogh’s Enclosed Field with Ploughman at the Museum of Fine Arts in Boston. Additional projects will take place at the Museum of Islamic Art in Doha, Qatar; OCA Museum in São Paulo, Brazil; and the University Art Museum, Tokyo University of Arts, among others. The Art Conservation Project is an extension of Bank of America’s global commitment to supporting the arts, which is a demonstration of the company’s commitment to delivering both social and economic value to the community. Bank of America’s support for the arts is diverse, and includes loans of its art collection to museums at no cost, sponsorships, grants to arts organizations for arts education, and the preservation of cultural treasures. At Bank of America, corporate social responsibility (CSR) is critical to fulfilling our core purpose of making people’s financial lives better. A commitment to growing our business responsibly is embedded in every aspect of our company, from our policies and practices to our services, products, governance and employee benefits. An important part of that commitment is forming strong partnerships across sectors, including nonprofit organizations serving community needs, bringing our collective networks and expertise to achieve greater impact. We’re proud of our employees’ volunteer efforts, support of diversity and inclusion, and environmental and social responsibility. Across our company, we’re focused on simplifying banking and investing, advancing better money habits and making an impact in communities around the world. Learn more at www.bankofamerica.com/about and follow us on Twitter at @BankofAmerica. Bob Haozous (Chiricahua Apache/Navajo) (b. 1943). "Zen Bear," 1985. Oxidized steel, concrete base, Self-base: 60.5” L x 19.25” W x 2” thick/ This sculpture is one of eight at the Heard Museum being restored through a 2015 Art Conservation Project grant from Bank of America.